All transactions are safe and secure with a reliable history in online purchasing behind each of our associates. Buy the To Do List Save the Cheerleader t-shirt to own Heroes clothing and merchandise. 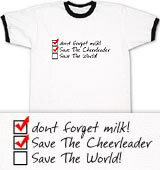 The front of this Heroes Save the Cheerleader Save the World t-shirt displays a To Do List, which features a list of three things to do: don't forget milk, save the cheerleader, and save the world. A red check mark is visible in front of the first two tasks, leaving you with the task of saving the world still left to accomplish. This fun piece of Heroes TV show apparel can be customized to fit your style. In addition to the To Do List Save the Cheerleader tee above, browse the Heroes Clothing Gallery for more apparel like men's and women's clothes, kids shirts or hoodies.